Christopher Morley once affirmed that the good life consists of three basic ingredients: learning, earning and yearning. Even though life revolves around what we sometimes call the daily grind, it involves much more! We are here to serve and glorify God. We do this by yielding our lives to the Lord, letting Him direct our lives. As jet streams provide steering currents for massive weather systems, the will of God should determine the course of our lives. In Philippians 2:5-8 we are told that the mind of Christ determined the course of His life and sealed His destiny. If you think about it, you see this at every milestone in His life: at age 12, Luke 2:40; at age 30, Luke 4:1-13; and at age 33, John 17:3. The up’s and down’s of life sometimes distract us. They can even rob us of a clear vision for the future. If, however, we take yielding our lives to the Lord seriously, we will embrace His vision for our lives. His will must be the “steering current” which determines the direction of our lives. This seems to be what Jesus had in mind when He stated: “If anyone would come after me, he must deny himself and take up his cross and follow me” (Mark 8:34). So, it seems like we should spend a few minutes exploring this topic. This should help us discover God’s sublime idea for our lives. How many visionary leaders do you know? Many of us can recall the names of only a handful of visionaries? Some of us even wonder what it means to be a visionary leader. I once read that a visionary is someone who describes tomorrow’s possibilities as clearly as yesterday’s sunset. Because resistance to change is so common in established institutions, many visionaries have either given up or have moved on to more welcoming environs. In far too many instances, we have mistakenly adopted a philosophy that resists being part of anything that we cannot control or explain. We cannot conceive of a God who is able to do more than we can imagine. So, we presume to limit God’s operation in our lives to that which we can, by mere human insight, comprehend. (2) Possibility Thinking… God is able to do immeasurably more than all we IMAGINE. Wow, imagine that! God is bigger than our ability to conceive Him! In this instance, the word translated as “imagine” derives from the root word noieo, which means to exercise the mind. To hear some people tell it, we’ve got to park our brains to be followers of Christ. That’s just not the case. God wants us to exercise our minds. In fact, His ability to do exceeding abundantly beyond all that we can think is, in itself, an invitation to let our imaginations run. What Is Christ’s will for His kingdom people? God wants us to be able to see the sublime. He wants us to be visionary children! Visionaries are nicked by thorns but still smell roses. 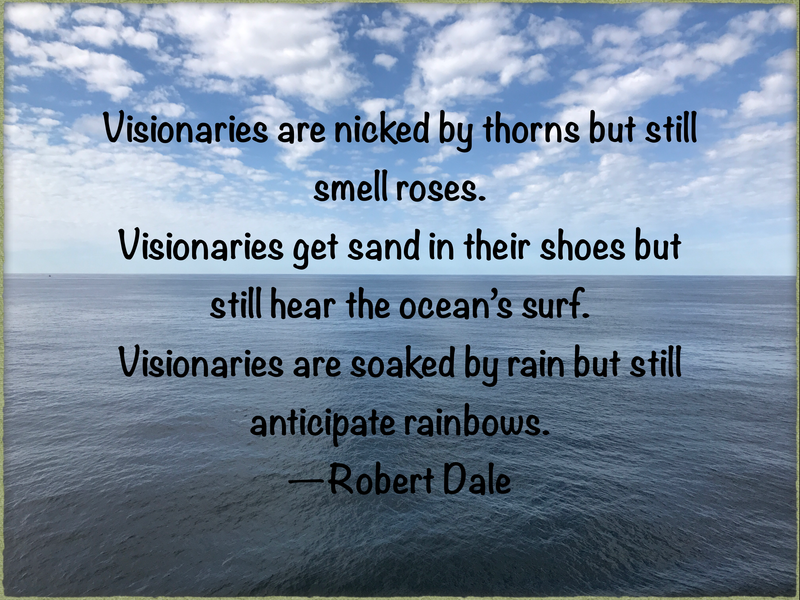 Visionaries get sand in their shoes but still hear the ocean’s surf. Visionaries are soaked by rain but still anticipate rainbows. —Robert Dale, Keeping the Dream Alive, p. 14. A visionary Christ-follower is a PASSIONATE PURSUER, a dream chaser. Our lives are to be characterized with the same intensity as Jesus Christ’s. This more than a positive mental attitude? It is being positive about doing the things that God wants us to do! It was Oliver Wendell Holmes that once stated that men either act on their passionate vision or risk never living at all! —Who are the visionary people that you have known? —How can we encourage one another to live into God’s sublime idea for our lives?